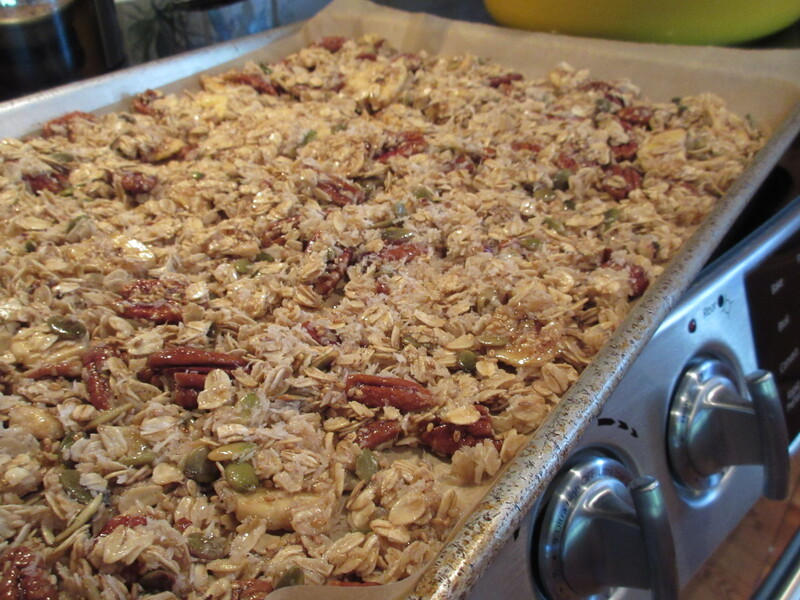 My latest obsession – homemade granola. 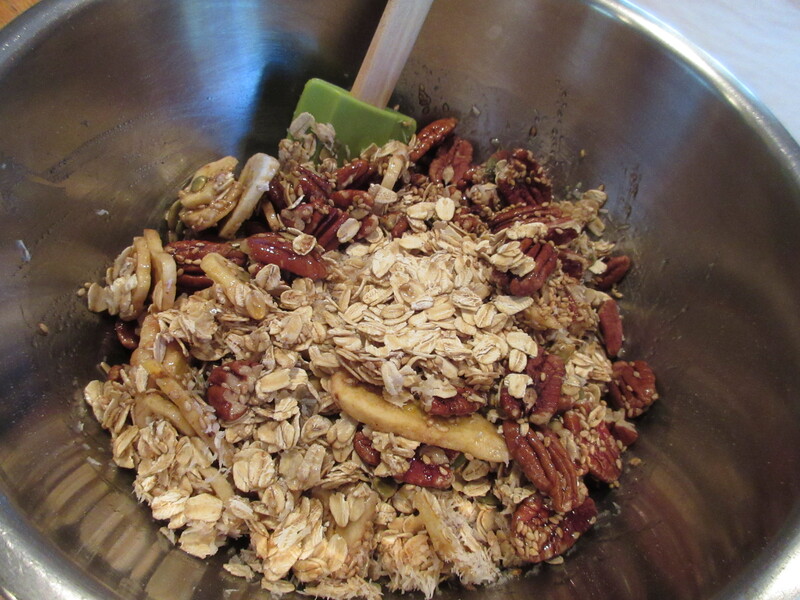 The inspiration to try my hand at making my own granola came from two recent experiences. 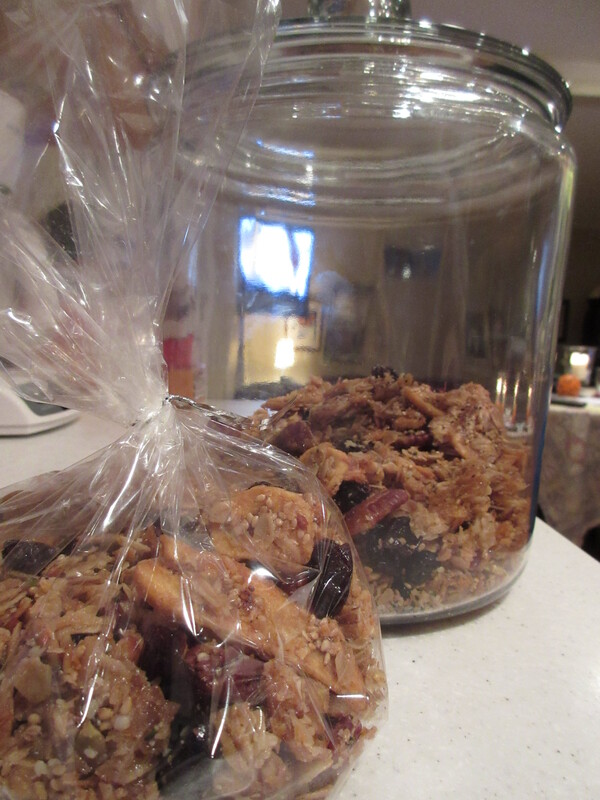 First, a wonderful chocolate granola made by Anke’s Fit Bakery which I first tried while visiting friends in Bridgehampton, New York. The second, served with fresh berries and yogurt at a sumptuous breakfast enjoyed at Patrick O’Connell’s the Inn at Little Washington in Virginia. I should add that in New Zealand, granola, muesli as the Kiwis call it, is ubiquitous and often served at the breakfast table. Based on these, I created my own recipe, easily modified to suit your taste and diet. Whatever I use, I try to keep it all organic. Give it a try! Preheat the oven to 300 degrees F. Toss all the dry ingredients together in a big mixing bowl. Mix the maple syrup and oil together. Add the wet ingredients to coat the dry. Spread onto a parchment lined baking sheet and bake, stirring a couple of times, until the mixture is dry and lightly golden, about 20-25 minutes. Remove from the oven and let cool then add the dried cherries, or other dried fruit. Store in an airtight container for a week or freeze for up to a month. I recommend eating it right away with some plain Greek style yogurt and a little honey if you want it a little sweeter! Variations: Try different nut varieties such as almonds or pistachios. Add or subtract other dried seeds or dried fruits. You can even try swapping olive oil for canola oil. Another delicious option, add 3/4 cup cocoa powder to the dry ingredients to make chocolate granola! I often give this as a delicious homemade gift.